"100% Natural" and "Fat Free"
12/22/2003 Original Petition to clarify the use of the terms "100% Natural" and "Fat Free" in food product packages. 01/07/2004 Assignment of Docket Number 2004P-0009/CP 1 by the FDA (PDF format). 01/07/2004 Letter to US Senator Barbara A. Mikulski asking for support of better labeling. 01/08/2004 Link to FDA dockets for January, 8, 2004 listing the petition. Letter to the American Heart Association requesting changes in their certification procedure to prevent high-fat foods from getting the heart-check logo (PDF format). Letter from the American Heart Association requesting the removal of the heart-check mark from my web site, but no information about their certification procedure. (PDF format). 08/11/2004 Petition Status Update No action to date because of other agency priorities. 12/12/2005 Final Decision on Petition "We have determined that there are not sufficient grounds to initiate rulemaking to modify our current policy on use of the term 'natural' or the current definition of 'fat free' as you have requested". Natural" and "Fat Free" in food product packages. I propose that the claim of "All Natural" or "100% Natural"
ingredients found in nature. The components of a "natural"
listed as subcategories under "Total Fat". have been associated with cardiovascular diseases. sense of security to the consumers of these products. are unfavorable to the petition. The purpose of the Nutrition Facts and the Ingredients list which are required by law on packaged foods is to help consumers make educated choices about the foods that they eat. When the information is deceptive or wrong the system has failed. Here are two proposals for correcting food labeling problems that are specially deceptive and can have deleterious health consequences for consumers. Copyright © 2003 S&S Brands, Inc.
What could be more wholesome than a bowl of "100% Natural Granola" with oats, honey, and raisins? 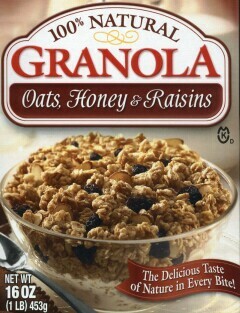 The granola is even kosher and sanctioned by Jewish law as being especially fit for consumption (the "K" symbol and the little "D" just below "Raisins" indicates that the product is kosher and contains some dairy product). However, when we read the list of ingredients we discover a problem. The ingredients are listed in order of decreasing weight in the product. From this, we know that the weight of the raisins is more than the weight of the vegetable oil, and that the weight of the oil is more than the weight of the almonds. Looking carefully, we notice that the "vegetable oil" consists of "partially hydrogenated cottonseed and/or soybean oil". Partially hydrogenated oil is only produced artificially at high temperatures with metal catalysts in chemical plants, which means that it is not natural at all. Hydrogenation fundamentally degrades the nutritional properties of natural vegetable oils and creates trans fats that cause cardiovascular diseases. The claim in the front of the box of "100% Natural" is clearly a misrepresentation of the contents. Maybe the "100% Natural" applies only to the oats, honey, and raisins. Maybe "100% Natural Granola" is only the trade name of the product similar to "Park Avenue" in New York that has no parks. I propose that the claim of "All Natural" or "100% Natural" should be reserved for products that contain only unaltered ingredients found in nature. The components of a "natural" product should be obtained only by application of physical processes of isolation or refinement, but should not include any chemical processes that alter the chemical composition of the natural components except for application of heat for cooking, baking, or toasting. Fats are triglycerides. Some margarines claiming to have no fat contain monoglycerides and diglycerides as primary ingredients. Chemically, all these glycerides are esters of glycerol and fatty acids which are metabolized in exactly the same way. Monoglycerides and diglycerides, like normal fats, also have 9 Calories per gram, but there are no regulations about reporting them as fats because they are used sometimes as emulsifiers that do not contribute significantly to the total calories. Furthermore, if monoglycerides and diglycerides are not considered "fat", then information about the saturation of their fatty acid components is omitted from the nutrition label. This particular example shows the creative ways in which manufacturers exploit loopholes in the "Nutrition Facts" regulations to make ludicrous claims. Looking at the ingredients of Promise® Fat Free Nonfat Margarine we see that the first five ingredients are "water, vegetable mono- and diglycerides*, salt, rice starch, gelatin". Water and salt, of course, have no calories. The monoglycerides and diglycerides are not fat by the strict definition of fat, although the asterisk has a footnote that says that this ingredient "adds a negligible amount of fat", meaning triglycerides. The weight of the monoglycerides and diglycerides (and their Calories) are ignored because they are not considered "fat". One serving of 14 grams has less than 0.5 grams of each: fat (triglycerides), carbohydrate (rice starch), and protein (gelatin). Therefore, all the values may be rounded to zero! Look at the Nutrition Facts: Total Fat 0g, Total Carbohydrate 0g, Protein 0g. A serving of 14 grams only has 5 reported Calories. Amazing! We don't know the proportions of water and mono- and diglycerides, but we can make some estimates. We can assume that each serving has 0.4 grams of rice starch and 0.4 grams of gelatin because greater amounts would not produce zeros on the Nutrition Facts. These two ingredients have about 3 Calories. An additional 0.2 grams of triglycerides ("a negligible amount of fat") would supply the other 2 Calories. Added together, these ingredients have the 5 calories per serving reported on the Nutrition Facts. Let us now assume that a serving has 0.5 grams of flavorings, colors, and all other minor ingredients with no calories. Thus far, we have accounted for 1.5 grams of the 14-gram serving size. The remaining 12.5 grams are water and mono- and diglycerides, but in what proportion? Since water is the major ingredient, the weight of water has to be greater than the weight of glycerides, but if the proportion of water is too high, the product would be liquid rather than spreadable. Experience with cake frostings suggests that equal weights of water and butter can produce stable emulsions. If a serving has approximately 6.3 grams of water, the remaining 6.2 grams are mono- and diglycerides with 56 Calories that are not reported on the Nutrition Facts. So, a serving really has 61 Calories. The mono- and diglycerides constitute 44% of the weight of the product and are responsible for 92% of the calories, but on a technicality they remain hidden from the consumer. A high-fat food is passed off as a low-calorie food. Isn't this malevolently crafty? It is a very cruel joke played on people who count calories trying to lose weight. This misinformation fools consumers and also organizations like the American Heart Association that certify products for nutritional content. To be certified by the AHA, a product serving must: 1) be low fat (less than or equal to 3 grams), 2) be low saturated fat (less than or equal to 1 gram), 3) be low cholesterol (less than or equal to 20 milligrams), 4) have a sodium value of less than or equal to 480 milligrams for individual foods, 5) contain at least 10 percent of the Daily Value of one or more of these naturally occurring nutrients: protein, vitamin A, vitamin C, calcium, iron or dietary fiber. If fatty acid glycerides were counted as "fat", which they really are, the product would not qualify for certification even if the product had only half of the glycerides estimated above. But this margarine has the AHA heart check logo and was listed on the AHA web site as certified as of December 2003. I propose that the definition of "fat" should include all esters of fatty acids and glycerol that contribute at least five calories per serving, and that the content of saturated, monounsaturated and polyunsaturated fatty acids for all these esters should be listed as subcategories under "Total Fat". This definition would encompass monoglycerides, diglycerides, triglycerides, phospholipids and other lipids that contribute significantly to the total calories. The recent case of mad cow disease has motivated many people to ask for more rigorous labeling of food products. Labels provide the only way for consumers to select wholesome products. Last month I submitted a request to the FDA to regulate 1) the use of the terms "All Natural" and "100% Natural" to apply to products containing only natural ingredients, and 2) the definition of "fat" to include all esters of glycerol and fatty acids so that we may have accurate Calorie values in the Nutrition Facts. With all the problems in the world, this may seem like a small matter, but it affects the health of all Americans. Please support better labeling of food products.